You have until November 6 to urge U.S. DOT to preserve climate accountability in transportation policy. This year, for the first time, state and regional transportation agencies have to measure the impact of their policies on climate change. That’s thanks to a federal rule enacted in the final days of the Obama administration. But if the Trump administration gets its way, this will also be the last year transportation agencies assess their climate impacts. Earlier this year, U.S. DOT tried to weasel out of compliance with the rule, claiming that Trump’s “Executive Order on Energy” had rendered it invalid. But that’s not how federal rules work, and DOT officials backed down after the Natural Resources Defense Council and several states sued to force compliance. Now the Trump DOT is at it again, and this time they’re not taking shortcuts. U.S. DOT is working to reverse the climate change assessment policy through the formal rule making process — a lengthy administrative procedure. Last week, the Federal Highway Administration opened the public comment period to get that process started. If you want U.S. 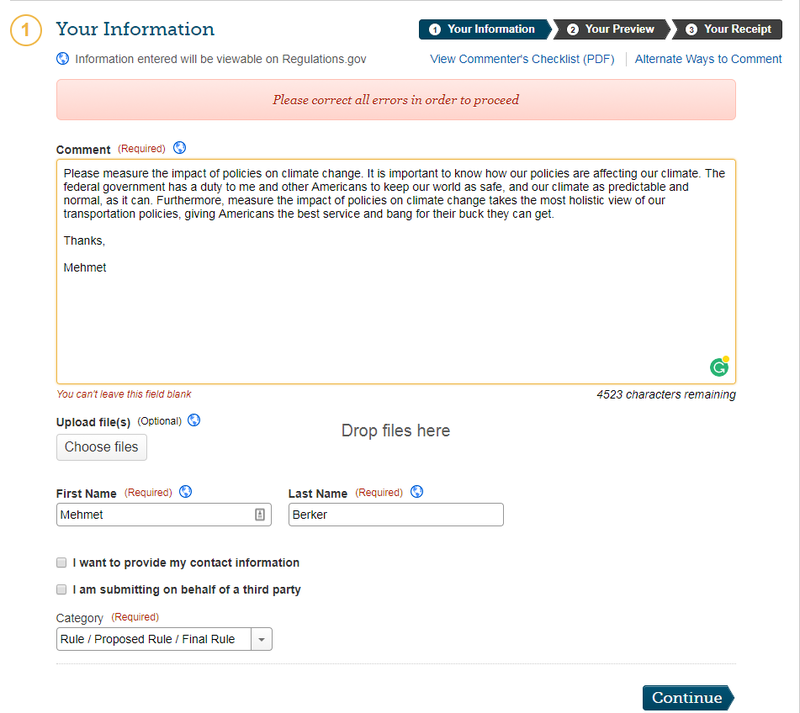 DOT to retain the climate accountability rule, you have until November 6 to weigh in. By U.S. DOT’s own estimates, the “cost” of assessing the climate impacts of transportation policy is negligible. The federal government projects to spend just $11 million over nine years on compliance. State and regional agencies already employ staff to monitor environmental quality who could take on the analysis. Nor is there widespread objection to the rule. NRDC’s Amanda Eaken points out that when the Obama administration proposed the climate rule last year, public feedback was overwhelmingly positive; 100,000 people weighed in to support it. “This is yet another example of the Trump Administration pretending that climate change doesn’t exist and attempting to wipe the books,” Eaken told Streetsblog. This time around, federal officials are accelerating the rulemaking process. The public comment period will only last 30 days, compared to 120 days when the Obama administration created the rule last year. The FHWA’s internal guidelines recommend at least 90 days, notes Eaken. The rushed timetable is a sign that the Trump administration has already made up its mind. Even so, every person who officially tells U.S. DOT to preserve climate accountability in transportation policy will create a record of opposition to this reckless policy change. I hate it when I agree with Trump/Republicans but as a centrist… it happens. Has anybody yet come up with a standard for how to measure or account for the move to clean vehicles. All-electric, hybrids, even clean diesel engines? Or would all studies be obsolete before they’re completed? Yup – it’s central planning gone amok. And lots of lost GDP! You can’t do that without severely hamstringing the most employed and productive group of people middle class non-center city dwelling individuals. In most cities, even East Coast metropolises outside of the core cities, many people need to at least drive to work as there is no alternative. I acknowledge this is a problem that needs fixing, but not regulatory just yet. Try adding transit and sidewalks to nearly every community in the US first and then we can talk about making cars to expensive for anybody but the upper middle class and above. “Central planning” is the result of our representative democracy. Let’s just say it’s more productive to vote than to complain. Given the continuing fall in transit ridership all over the country I’m more concerned with losing those subsidies. Since “we all” rely on roads for our daily bread they’re likely to be better funded. Even a 100% clean electric car imposes vastly more GHG emissions through manufacturing, disposal, maintenance, storage, and road space than alternative transportations. Until you find your utopian world, near zero emissions can be a big assist for the next few decades. As a transit fan I’m more dismayed that ridership numbers are falling all over (our) country and since we’ll likely remain a representative democracy for at least another 100 years, less vehicle emissions is better than more. You equate VMT with economic activity. That’s a fallacy. Besides being 20% more efficent, it also offers much improved acceleration. 0 to 50 mph take only 20 seconds, which is dragster-like in the bus world. Diesel buses take anywhere from ~25 seconds to 50 seconds to do the same thing, with 35 seconds being typical. Thanks for the link, hadn’t read that. Presidents don't get to pick and choose which federal rules they comply with. The White House is trying to squash assessments of how transportation projects affect carbon pollution. NRDC, Clean Air Carolina, and U.S. PIRG are suing the administration to ensure these climate impacts are publicly disclosed. The NRDC fended off a White House attack on an Obama-era rule aimed at documenting and forecasting the impact of state transportation policies on carbon emissions.